Bilbo Baggins at the door of his hobbit-hole. Nearly twenty years ago, a production team headed by Arthur Rankin and Jules Bass set about to animate J.R.R. Tolkien's The Hobbit, one of the most influential fantasy novels of all time. In turn, the film has itself become (to our minds) a classic. Made long before the days of computer animation and Disney's animation "event" films, The Hobbit is still an impressive movie to watch for its visual creativity and its faithful adaptation of a detailed book in only 77 minutes. The Hobbit is about, well, a hobbit. Hobbits are short little people like dwarves, only less irritable and without beards. The hobbit in question is Bilbo Baggins, an unadventuresome sort (like most hobbits) who goes on an adventure at the behest of the wizard Gandalf. Gandalf benignly bullies Bilbo into joining a company of dwarves on their quest to reclaim their mountain home and treasure from the dragon Smaug. Along the way they meet elves, goblins, wolves, and the like. As a story, The Hobbit is appealing on several levels. Bilbo's fish-out-of-water situation helps viewers identify with him, and also makes his successes all the more sweet. It's a good old-fashioned quest, with all the trimmings we're used to and a fairly happy ending. And though the events are important on a large scale, the film is really the story of one person. By the end of Bilbo's adventure, he finds, as Gandalf promised, that there are depths to this hobbit at which even he had never guessed. Tolkien fans who watch The Hobbit won't be disappointed. 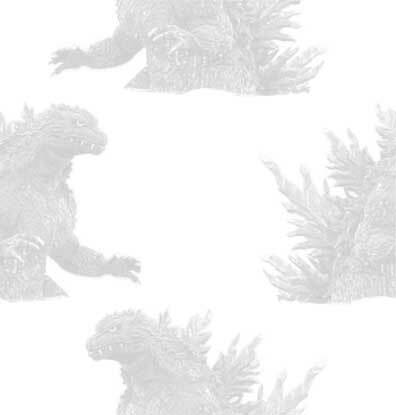 Despite its brevity, an amazing amount of original material was included in the film version. This was achieved mostly by allowing the visuals tell the story, and by clever use of Tolkien's original songs. The songs are, quite frankly, amazing. They have all been set to appropriate music and are used to forward the plot rather than stop it dead in its tracks. Aspiring animators would do well to emulate Rankin & Bass in this. 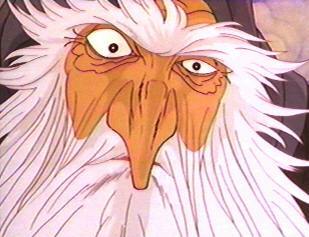 Credit must also be given to the voice talents of Orson Bean as Bilbo, Richard Boone as Smaug, and John Huston as Gandalf (yes, that John Huston). Also pitching in are Hans Conried (formerly Snidely Whiplash from Adventures of Bullwinkle and Rocky, also the Grinch in Halloween is Grinch Night) and Brother Theodore, horror movie veteran, as Gollum. Their voices are the ones speaking in our minds when we read Tolkien's work to this day. If we have any complaints about The Hobbit, they involve the fact that more of the book wasn't translated to the screen. Although the basic events are shown, the book versions are much richer and more interesting. Alas, the anticipated attention span of the target audience didn't allow for a more complex treatment of the original book. 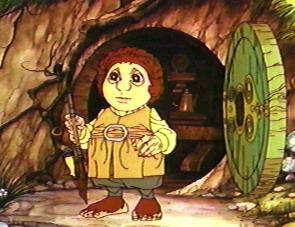 We think it might be fun for Rankin-Bass to return to The Hobbit with an expanded version, although some would inevitably come to hate it. (Star Wars Special Edition comes to mind as an example.) Yes, as we said before, this is a faithful adaptation of the book, but couldn't they have given us fifteen or twenty more minutes of similar adaptation? We wonder how children raised on The Little Mermaid and Aladdin react to The Hobbit. Have they been raised to expect grandiose Disneyesque productions, or would they enjoy this humbler effort? The animation in this movie is completely hand-rendered rather than computer-assisted, and the colors more earth-tones than primary colors. Bilbo doesn't sing about his troubles or pal around with an animal sidekick. And the songs, though an integral part of the storytelling, are poetic ballads rather than catchy Broadway showtunes. We would like to think that The Hobbit can still captivate children as we were captivated back then. Hopefully, kids won't reject it out of hand for its subtlety.